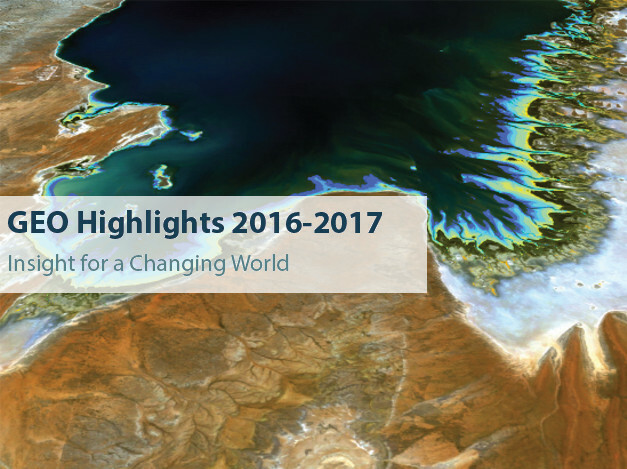 The GEO Highlights report showcases some exemplary efforts the Group on Earth Observations (GEO) community has made over the past year transforming Earth observations into knowledge and tools for sustainable development. 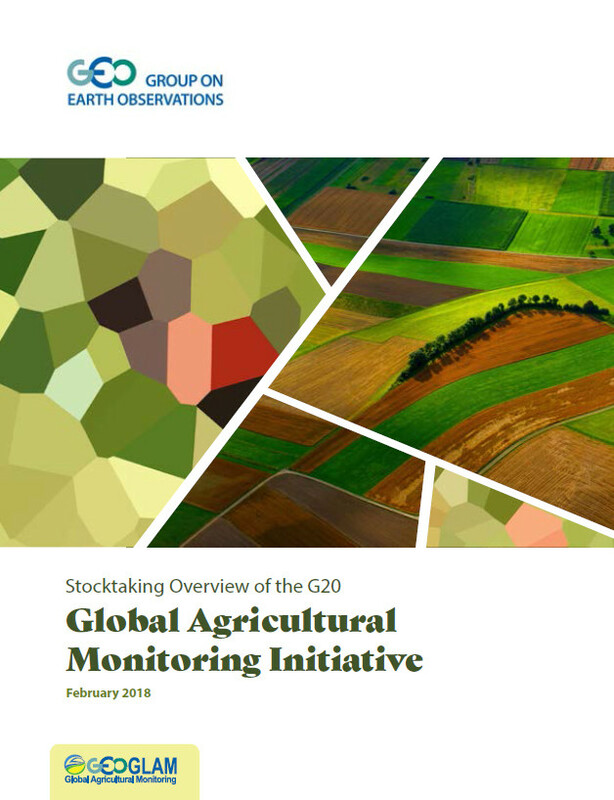 This publication presents the progress made by the Global Agricultural Monitoring Initiative (GEOGLAM) since its 2011 inception until February 2018. A GEO Flagship Initiative, GEOGLAM increases market transparency and improve food security by producing and disseminating relevant, timely, and actionable information on agricultural conditions and outlooks on production at national, regional, and global scales. The Group on Earth Observations (GEO) is a truly unique partnership of national governments and international organizations aimed at ensuring that the information about our planet necessary to address global challenges is available to all. With over 100 government Members plus the European Commission, and over 100 Participating Organizations, GEO is a confirmation of the willingness to share Earth observation data for the benefit of humankind. AfriGEOSS is helping identify user needs, tools using Earth observations as well as increasing capacity and supporting data infrastructures, for a healthy environment for all. AfriGEOSS is strengthening the African Space Policy and Strategy to advance the uptake and use of Earth observations for decision-making in Africa through the Global Earth Observation System of Systems (GEOSS) to ensure we deliver the information required to support policy and effective decision making. The Global Indicator Framework captures the interlinked, multifaceted and ambitious aspirations for the continued development of nations and societies. Effective reporting of progress toward these Indicators requires the use of multiple types of data, what we have in hand - traditional national accounts, household surveys and routine administrative data – as well as new sources of data, namely Earth observations, geospatial information, citizen science, and Big Data. Read details in this four pager flyer. GEO convenes effective partnerships for societal benefit through use of free and open Earth observation (EO) data. The GEO Initiative ‘Earth Observations in Service of the 2030 Agenda’, together with the Committee on Earth Observation Satellites (CEOS) have issued a new report to highlight case studies of how EO responds to sustainable development, whether for health, disaster risk reduction or environmental protection. No one country has the resources needed to collect the Earth observations data required for addressing the major global environmental issues of today. A global system of systems approach leverages the existing infrastructures used for Earth observations. This approach both fosters the continuity of observations and improves access to data, information, and services. GEO is an Intergovernmental Organization working to improve the availability, access and use of Earth observations. Our vision for the future is a world where decisions and actions are enhanced by coordinated, comprehensive and sustained Earth observations and information, for the benefit of society. The Members and Participating Organizations of the Group on Earth Observations (GEO) make their Earth observation and environmental data available through the GEO Global Earth Observing System of Systems (GEOSS) portal. The preferred approach of the organization is to provide open access and unrestricted use to those data through the GEOSS Data-CORE (Collection of Open Resources for Everyone). This approach has not been adopted by all the GEO participants, despite the call for even greater openness that is promoted by the revised GEO Data Sharing Principles for next decade. The report was produced by CODATA specifically at the request of the GEO Secretariat in order to summarise arguments in favour of broad and open data sharing. Download here the GEO Branding Guidelines and GEO background language. Below you can find GEO branding elements for download. Right click the format of your choice and choose "save as"
GEO is a partnership of governments and organizations that envisions “a future wherein decisions and actions for the benefit of humankind are informed by coordinated, comprehensive and sustained Earth observations”. GEO membership includes 104 Member governments and 109 Participating Organizations comprised of international bodies with a mandate in, and/or use of Earth observations. Together, the GEO community is creating a Global Earth Observation System of Systems (GEOSS) that will link Earth observation resources world-wide across multiple Societal Benefit Areas - Biodiversity and Ecosystem Sustainability; Disaster Resilience; Energy and Mineral Resources Management; Food Security; Infrastructure & Transportation Management; Public Health Surveillance; Sustainable Urban Development; and Water Resources Management - and make those resources available for informed decision-making. Below are links to several documents and resources that provide a brief overview of GEO and its activities. As GEO begins its second decade we are looking to deepen our engagement with decision makers in the government, science/research and private sectors, explore the potential value of Earth observations to these sectors, and identify existing gaps in important Earth observation data and information. GEO Homepage - provides access to detailed information about GEO's eight Societal Benefit Areas and the GEOSS Portal (access to 400-million plus resources provided by GEO's partners). GEO Strategic Plan 2016-2025: Implementing GEOSS - adopted by the GEO-XII Plenary and Ministerial in Mexico City in November 2015, this document articulates GEO's vision and objectives for its second decade. Other key documents can be found here. Filmmakers � make a three minute video on how GEO and Earth observations are helping address global and regional challenges. Three finalists will be screened during the Mexico City Ministerial Summit. Competition closes end September. Last call for meeting rooms available 9-12 November for Side Events at the Ministry of Foreign Affairs and Hilton Reforma (free of charge). A GEO Exhibition booth is a great way to showcase achievements to inform decision making. Due to the fact that the Latin America Geospatial Forum is held at the same time in the same venue, this GEO Exhibition has a larger audience than ever before. The Global Framework on Disaster Risk Reduction 2015-30 listed development of Earth Observation and its information infrastructure as a priority. (1) 'Trusted data services to support climate change research' is convened by the World Data System. (2) 'Science and the Road to Transformation: Opportunities in the post-2015 global climate regime' is convened by ICSU. Scientists, policy makers and indigenous peoples coordinated plans to better understand and plan for changes in the Arctic environment at the Arctic Science Summit Week in Toyama, Japan in April. GEOSS now has more than 174 million resources discoverable on its Portal thanks to interoperability arrangements with the Global Biodiversity Information Facility (Switzerland), ESA Federated Earth Observation Pilot (European Commission) Chile Geoportal, Geoscience Australia, the National Institute of Geographic and Forest Information in France and Digital Globe (US). Click here for the latest GEOSS brokered capacities report. The WMO Congress adopted a new policy for International Exchange of Climate Data and Products to Support the Implementation of the GFCS, recognizing the value of GFCS data and products being made accessible on a free and unrestricted basis. A�new Secretary General was elected; Petteri Taalas�from Finland was elected to a four-year term starting 1 January 2016. He will succeed�Michel Jarraud. The Japan Aerospace Exploration Agency (JAXA) will begin publishing elevation sets with a resolution of 30 meters horizontally. First areas are South and South East Asia, expanding to global coverage. The USGS has improved processing of Landsat data including balancing lighting variance due to time of day or season, improving data consistency and comparability so it is easier to use. The International Renewable Energy Agency (IRENA) announces the launch of an app available for smartphones which allows users to plan for renewable energy products and help realize global renewable energy potentials. The app accesses the IRENA Global Atlas data catalogue which is part of the energy community portal Webservice-energy.org developed by MINES ParisTech offering services for the GEO energy community and has been enabled for interoperability through GEOSS. Students and research associates are invited to submit creative ideas on using Earth observation to meet market needs. The University Challenge is supported by GEO. Along with a EUR 1,000 cash prize, winners will receive a consulting package to develop their business case at an ESA Business Incubation Center, satellite data quota and will present the winning service at the GEO-XII Plenary meeting. Smartphone apps using open or crowd-generated data on dark skies, non-native species, allergies and natural hazards are some of the competition winners selected for European Commision funding, for release at GEO-XII in November. The number of resources such as training material, best practices and marketing tool kits registered on the GEOCAB portal have doubled since its launch at the GEO-XI plenary in November 2014. The engineers building the GEO System of Systems describe how Big Data will impact the digital tool�s infrastructure in a recent paper published in Science Direct. Senegal's Ministry of Agriculture has been collecting data since 1984 and is now improving data and analysis, consolidating data and creating a model to improve yield forecasting. Satellite and in-situ data are provided by participating organizations for an event supersite in response to the magnitude 7.9 Earthquake and subsequent shocks and earthquakes. A $3.6 million research project has NASA, NOAA, EPA and USGS collaborating to analyse ocean color satellite data for early warning on algal blooms in freshwater systems, and public health advisories. Participants from 18 African countries as well as international organizations including GEO BON and GBIF attended the event organized by the South Africa National Biodiversity Institute (SANBI) and made a joint statement referencing the importance of Earth observations for biodiversity. A one-day GEO workshop brought together participants for capacity-building on EO including those running programmes for education and producers of data and software tools. GEO�s Coastal and Inland Water Quality Working Group summit set out the requirements for water quality observing system components and developed a plan to implement an integrated, global water quality monitoring and forecasting service. The GEO Community of Practice on Geohazards has produced a community science position paper on the often overlooked impact of low-probability high-impact geohazards, with support from ESF. "We dream of a world in which policy makers have easy access to Earth observations for sound decision- making. We pledge to advocate for broad, open data sharing so that all GEO information resources will advance the goals of Eye on Earth worldwide." Q&A with Barbara Ryan in the G�ANT project's CONNECT Magazine on the challenges of building GEOSS and the future of the System of Systems for Earth observation. The Group on Earth Observations (GEO) Implementation Plan Working Group (IPWG) recently hosted a meeting of representatives of UN Organizations, Specialized Agencies, Programmes and Conventions to discuss how to strengthen the engagement of GEO with the United Nations. The overall objective was to reaffirm the value and improve the use of Earth observations in UN processes, with a special focus on the post-2015 development agenda. The participants agreed that complementarities and synergies between the UN and GEO should be nurtured with the objective of increasing the quality, availability and use of Earth observation data and information for sustainable development. The Summary document and related information is available here. The Group on Earth Observations (GEO), in collaboration with the UN Statistical Division, Japanese Space Exploration Agency (JAXA) and the Government of Switzerland co-hosted a Side Event, "The Role of Earth Observations in Developing Indicators for the Post-2015 Development Agenda: Starting a Dialogue", during the 46th UN Statistical Commission Friday Seminar at the United Nations Headquarters in New York on February 27th. The Side Event was designed to start a dialogue with National Statistical Agencies on the role of Earth observations in monitoring and achieving the post-2015 development goals. The GEO Implementation Working Group (IPWG) continues to develop the new GEO Strategic Plan 2016-2025: Implementing GEOSS. The IPWG held its 4th and 5th sessions in Washington, DC (December 2014) and Geneva, Switzerland (February 2015), both of which were preceded by stakeholder engagement sessions. More information on the IPWG's activities is available here. GEO through, its Members and Participating Organizations, has been deeply engaged in the preparations leading up to the World Conference on Disaster Risk Reduction (WCDRR) to be held in Sendai, Japan on 14-18 March, 2015. The draft Framework includes language recognizing that Earth observations have a clear role in Disaster Risk Reduction. In addition, GEO has been working with a group of global partners to develop a framework for the integration of Earth observation technologies into Disaster Risk Reduction. The Group on Earth Observations (GEO) is pleased to welcome the Republic of Ecuador (96th) and the Socialist Republic of Vietnam (97th) as its newest Members. Congratulations and welcome! The 33rd session of the Group on Earth Observations (GEO) Executive Committee will convene on 19-20 March 2015, in Geneva, Switzerland. The GEO-XII Plenary and 2015 Mexico Ministerial Summit will be held in Mexico City, Mexico on 11-13 November 2015. The 2015 Mexico Ministerial will occur on Friday, 13 November at the Ministry of Foreign Affairs in Mexico City. The GEO-XII Plenary will convene on Wednesday-Thursday - 11- 12 November and will be preceded by two days of GEO Board meetings and Side Events (9-10 November). The Plenary, which will also feature an Exhibition, is being held concurrently with the United Nations Global Geospatial Information Management (UN-GGIM)-Americas regional meeting and the Latin American Geospatial Forum (LAGF). Detailed information about all of these events will be made available in the next several weeks. The 3rd and 4th GEOSS Science and Technology Stakeholder Workshops will be held in Norfolk, VA, USA from 23 to 26 March 2015. More information can be found here. Short-term (7 months) Communications Manager position. GEO has 100 Members! Congratulations and welcome to Somalia and Kenya who become the 99th and 100th Member of GEO respectively. "We recognise that the sharing of Earth observation data and information will strengthen science, knowledge, and decision-making in the areas discussed today and in others. We intend to continue to work together through the intergovernmental Group on Earth Observations (GEO) to enable policy makers to better address these environmental, health, and socio-economic challenges." The Group on Earth Observations Ministerial Summit 2015 will take place on 13 November 2015 in Mexico City, hosted by the Government of Mexico, with invitations to Ministers from GEO�s 100 Members and High Level representatives from the 87 Participating Organizations. Latin America Geospatial Forum, sponsored by Geospatial Media: Strengthening Geospatial Collaboration for Sustainable Growth. The new center for the Gabonese Agency for Study of Earth Observation (AGEOS) was inaugurated on Saturday 29 August. The satellites will provide photographs to commercial clients while helping with harvest assessment, geological disaster prevention and resource surveys. The CBERS_04 Earth observation satellite is the fourth to be developed by China and Brazil in a cooperation agreement signed in 1988. It became operational on 13 July following its launch on 7 December. Himawari-8 geostationary meteorological satellite managed by the Japan Meteorological Agency (JMA) began operation on 7 July capturing Earth images over the Western Pacific region for use in weather analysis, and contributing to prevention and mitigation of disasters. The report shows uptake of Earth observation data in decision making processes through the Societal Benefit Areas of GEO and materials presented demonstrate the benefits of Earth observations. The results of a survey of UN-wide, large scale mapping at 1:25,000 by UN-GGIM and ISPRS. The 193 Member United Nations General Assembly formally adopted the 2030 Agenda for Sustainable Development along with a set of 17 Global Goals on 25 September. Paragraph 76: We will promote transparent and accountable scaling-up of appropriate public-private cooperation to exploit the contribution to be made by a wide range of data, including Earth observation and geospatial information, while ensuring national ownership in supporting and tracking progress. Established by the UN Statistical Commission, the IAEG is developing an indicator framework for the monitoring of the proposed Sustainable Development Goals and their Targets. It comprises national statistical offices in open consultation with countries, regional and international agencies, civil society, academia and the private sector. GEO has raised the importance of integrating Earth observations with national statistics to better measure and monitor the SDGs to the IAEG , which is due to submit its recommended indicators to the Statistical Commission on 30 November. GEO has joined the newly formed, Global Partnership as an Anchor Partner, along with eight Governments (all GEO members: Colombia, France, Kenya, Mexico, Morocco, Senegal, UK and US).� Created as an outgrowth of the UN SDG development process, the Partnership will strengthen country data-ecosystems, fill critical data gaps, improve data literacy and capacity, increase data openness, sharing and leveraging, mobilize and align resources and reinforce and catalyze principles and protocols. The GPSDD is composed of Private Sector Partners, International Agencies (including three GEO Participating Organizations: the UN Economic Commission for Africa, the UN Economic Commission for Asia and the Pacific and FAO), as well as Statistics/Data/Research Organizations, Civil Society and Foundations. The Committee of Experts on Global Geospatial Information Management (UN-GGIM) report on the role of geospatial information in the Sustainable Development Goals was issued following a meeting in New York on 4 August. The Group on Earth Observations recently joined global experts in science, policy-making, research and technology at the Eye on Earth Summit to address complex issues around data-sharing and informed decision-making for sustainable development. �Dr Philemon Mjwara, GEO Co-chair from South Africa delivered an address and participated on a Panel discussing data supply issues. GEO Secretariat Director Barbara Ryan delivered a keynote address at the RDA Plenary in Paris on 23 September highlighting how brokering methodologies are essential for discovering and accessing Earth observations and how broad, open data policies are good for national economies. GEO participated in the International Scientific Conference held at UNESCO Headquarters in July, the largest science forum in advance of the UNFCCC Conference of the Parties (COP21) to occur in December in Paris. The GEO Secretariat participated in a Side Event hosted by the International Council for Science (ICSU): �Science and the Road to Transformation: Opportunities in the Post-2015 Global Climate Regime�.� GEO has endorsed the Conference Outcome Statement to be published and distributed during COP21. Read the article and watch the video. GEO joined hydrology and development experts in a session �Let�s talk about water� at the science, technology and innovation event at the Organization for Economic Co-operation and Development (OECD) in September in Paris. The YOPP Summit was held at WMO in July with outcomes agreed upon by the Summit Planning Group, including the WMO Integrated Global Observing System (WIGOS). A pioneering force and essential member of the US team that helped establish GEO in 2005, Len Hirsch passed away in June. He will be greatly missed by the GEO community. Technical experts from the Convention on Biodiversity �(CBD) met in Geneva in September to present a new generation of indicators integrating Essential Biodiversity Variables (EBVs). The event was held during the design phase of the new GEO Strategic Plan 2016 � 2025 to build momentum and coherence in Europe around plans for the next decade. 220 participants from 27 countries attended the GEOSS Asia-Pacific Symposium held in Beijing in September. The GEO Task �Oceans and Society: Blue Planet� held its second Symposium in Cairns, Australia, from 27 to 29 May 2015. The program included presentations, posters, discussion and workshop sessions focussing on the six Blue Planet Components. The International Society for Digital Earth (ISDE) Symposium theme “towards a one-world vision for the blue planet”. Best practices shared by the SERVIR community, a joint initiative of NASA and USAID. EUMETSAT hosted the 2015 Committee on Earth Observation Satellites (CEOS) Strategic Implementation Team (SIT) session in Darmstadt, Germany. A first workshop was held in September at MINES ParisTech addressed the needs for coordination and collaboration on the detection of gaps and redundancies in the Global Earth Observation System of Systems (GEOSS). The GEO Global HF meeting coincided with the Seventh Session of the Global Ocean Observing System (GOOS) Regional Alliances. The Research Data Alliance�s Technical Advisory Board provides technical expertise and advice to the Council, assists in developing and reviewing RDA Working Groups and is responsible for the development, maintenance and evolution of the RDA Technical Strategy. Congratulations Wenbo! GEO Participating Organization, The International Centre for Integrated Mountain Development, was awarded at the Esri International User Conference in July. GEO BON�s Gary Geller joins colleagues to propose collaboration on a global biodiversity monitoring strategy. Planktonologists working with GEO's Blue Planet Oceans initiative have produced the first complete piece of research on seasonal changes to microscopic life forms in the Red Sea. The findings can be used to assess oxygen generation and carbon retention and have been shared with the wider scientific community through the ESA learning platform Learn EO! Agriculture is a key remote sensing application with high temporal and spatial requirements such as GEOGLAM, as outlined in Fruitworld. Congratulations and welcome to Uruguay as the 101st GEO Member and to The United Arab Emirates as the 102nd GEO Member. February 10 � 12, GIM International Summit Update a closer link between society�s needs and geospatial solutions. March 1 � 3 Research Data Alliance 7th Plenary, Tokyo, Japan. A working meeting that brings together data scientists, librarians, computer and domain scientists, policy makers and strategists. March 2 � 4, Global Climate Observation: the Road to the Future, GCOS Open Science Conference, Amsterdam, The Netherlands. First event of its kind. Registration by 15 February. March 8 � 9 GEO Executive Committee Meeting, Geneva, Switzerland. March 10, Data to Decisions: valuing the societal benefits of geospatial information, Paris, France, organizing committee � GEOValue community, in collaboration with OECD, NASA and USGS. Registration closes Feb 8. March 16 � 17, InterMET Asia 2016 conference, Singapore. Featuring expert sessions dedicated to specific weather affected areas. Participating Organizations gain prominence in GEO through new arrangements that enable them to play a larger role in the next decade of GEO. GEO-XII Plenary documents, Statements and presentations and Mexico City Ministerial Summit documents. GEO-XII Side Event on SDGs. GEO's Global Agricultural Monitoring programme GEOGLAM held its first Advisory Committee meeting. The Value of Open Data Sharing white paper prepared for the GEO Plenary by the ICSU Committee on Data for Science and Technology (CODATA) shows how shared Earth Observation data brings a multitude of environmental and economic benefits. GEO and UN-GGIM organized a Land Cover Side Event focusing on harmonized pathways towards policy needs. Data providers and users of land cover data attended and key outcomes, background material and all presentations can be accessed at the event website. 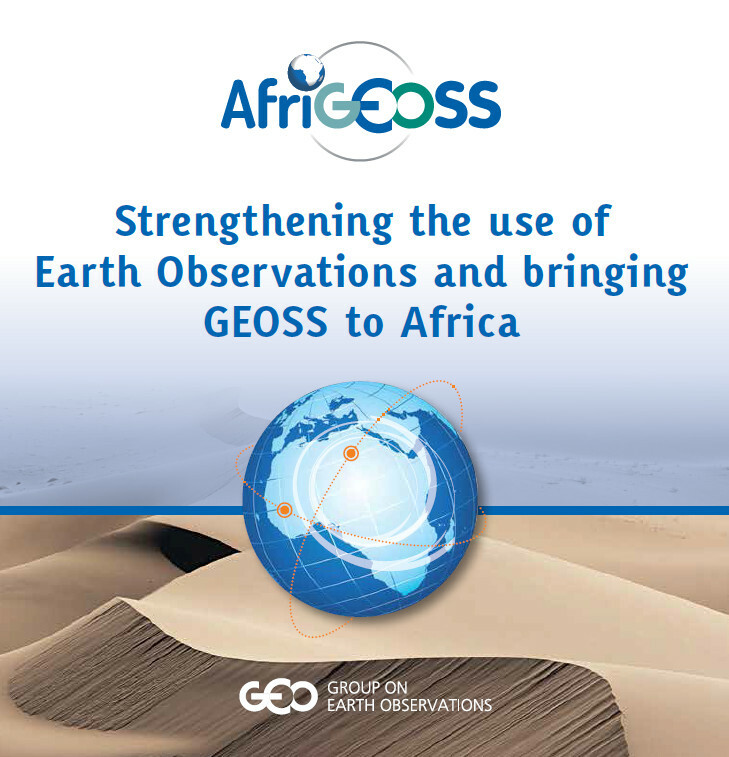 GEO-XII Side Event on AfriGEOSS highlighted the importance of collaboration in Africa in order to use Earth observations to address societal needs. Participants highlighted projects and initiatives they are undertaking. 195 Member states signed up to the Paris Agreement on climate change adopted by the United Nations Framework Convention on Climate Change (UNFCCC) Conference of the Parties (COP) on Saturday 12 December. It will be open for one year for signature on 22 April 2016 -Mother Earth Day. GEO is referenced in the UNFCCC Subsidiary Body for Scientific and Technological Advice SBSTA document circulated prior to COP-21, see paragraphs 8, 19 and 30. GEO Secretariat Director Barbara Ryan participated in a round table discussion hosted by the U.S. White House Office of Science and Technology Policy Climate Services a Global Public Good: Transboundary Collaboration, Science and Data innovation. Director Ryan was also a panelist in a session hosted by the Nordic members with the Integrated Carbon Observation System (ICOS) titled Trust but Verify towards a comprehensive Global Observation, Information and Verification System on Greenhouse Gases. UNFCCC: SBSTA documents Submissions from Observers, SBSTA 43 1 � 4 Dec.
UNFCCC LPAA: Paris Pact on Water and Climate Change adaptation. UNFCCC: The Global Facility for Disaster Reduction and Recovery (GFDRR), partnered by the World Bank; WMO and UNISDR came together to launch the Climate Risk and Early Warning Systems (CREWS) Initiative - to mobilize $100m by 2020 in a trust fund. UNFCCC: Launch of the UNFCCC Climate Technology Centre and Network (CTCN) Engagement Platform. CEOS: New Climate Chapter for CEOS Database. Content links to existing comprehensive information on Missions, Instruments and Measurements of CEOS agency EO mission and includes information on Essential Climate Variables (ECVs). CEOS: CEOS Earth Observation Handbook. The CEOS Earth Observation Handbook presents the main capabilities of satellite Earth observations, their applications and a systematic overview of present and planned CEOS agency Earth observation satellite missions and their instruments. ESA: Why is soil moisture an essential climate variable. ICSU and CODATA: "Open Data in a Big Data World" � the publication authored by four organizations led by CODATA/ICSU includes guiding principles on open access to big data. ICSU: The International Council for Science and Climate Change, 60 years of facilitating climate change research and informing policy. Highlighting the scientific community�s contributions to the development of climate science and ICSU�s role in facilitating collaboration to inform policy. GEO has a one-page description and is referenced for its coordinating role with GCOS. UNEP: The Adaptation Gap 2014 complementary to the annual Emissions Gap report. Assessment of the gap bringing emissions down to the levels required by 2020. WMO: The Global Carbon Budget 2015, said that Carbon Dioxide (CO2) emissions from fossil fuels and industry increased by 0.6% in 2014, with a total of about 9.8 Gigatonnes of carbon emitted to the atmosphere. This is 60% above emissions in 1990, the Kyoto Protocol reference year. WMO: Satellites for Climate Services, Case Studies for establishing an architecture for climate monitoring from space published by WMO and the European Commission Joint Research Center. Case studies from around the world show satellites can provide a critical baseline for many climate services. 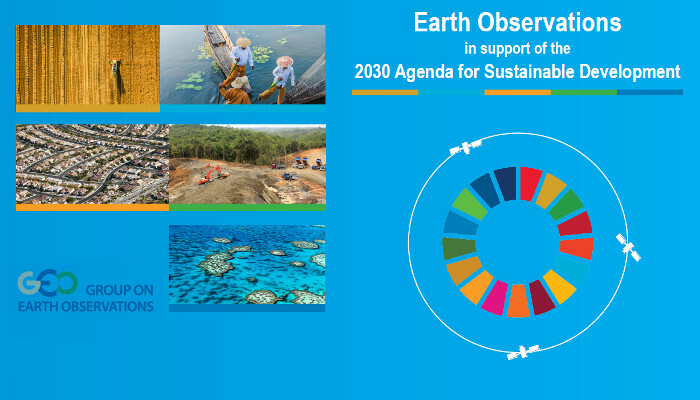 GEO has committed to undertake a significant new initiative to integrate Earth observations and geospatial information in the design and implementation of national processes to measure and monitor progress toward achieving the Sustainable Development Goals (SDGs). The focus will be on GEO creating collaborations between the national GEO community and the National Statistical Officers in individual countries to maximize the potential contributions of Earth observations and geospatial information to their efforts to measure progress toward the specific indicators. The final decision on the number, type and formulation of the indicators in the final proposal of the set of global indicators will be taken by the IAEG-SDG Members. The UN Statistical Commission will review the proposal and submit it to ECOSOC and UN General Assembly for adoption. GEO is working closely with the UN Statistics Division and the UN Global Geospatial Management Initiative (UN GGIM) to develop this dialogue on a global basis, beginning with a session on "Geospatial Information and Earth Observations: Supporting Official Statistics in Monitoring the SDGs", to be held during the 47th Annual Meeting of the UN Statistical Commission on 7 March 2016. African Union: an Group on Earth Observations supports Africa Space Policy and Strategy. China: an International Symposium on Earth Observation for the Silk Road, organized by the International Society for Digital Earth in China highlights the use of EO technology for the Belt and Road Initiative. European Commission: Sentinel-2 data has been opened online. Mexico: Dr. Julio A. Santaell-Castell was appointed President of INEGI by its Governing Board and the President of Mexico, Enrique Pe�a Nieto. South Africa: Science Forum South Africa (SFSA) Science Diplomacy Awards Committee awarded GEO with the SFSA Science Diplomacy Award in the category recognizing "an international science partnership which has made an outstanding contribution to advancing global sustainable development". United States: USGEO Program�s new draft Common Framework for Earth Observation Data clearly makes reference to GEO Data Management Principles. United States: Department of the Interior launches new, interactive web tool to show effects of 16-Year drought in the Colorado River Basin, following the White House Roundtable on Water Innovation. US and EU: Jason-3, a U.S.-European satellite mission, was successfully launched on 17 January to track the rate of global sea-level rise and forecast the strength of tropical cyclones. Belmont Forum: the Belmont Forum has for the first time adopted an Open Data Policy and Principles. GEO is mentioned as a partner in the implementation of the e-infrastructure initiative. GCOS: released its report Status of the Global Observing System for Climate (GCOS-195) which was submitted to the 43rd session of the SBSTA, at COP-21. The report can be downloaded here. International Geosphere-Biosphere Programme (IGBP) closed at the end of 2015 after almost three decades of coordinating international research on global change. Its work is continued by activities in Future Earth, a Participating Organization in GEO. ITU: at the World Radiocommunication Conference 2015 (WRC-15) held in Geneva from 2 to 27 November 2015, a the GEO community need to preserve the 5350-5470 MHz frequency range, which is of high importance to the Copernicus Sentinel-series satellites and other Earth observation (EO) missions of GEO Members were incorporated into the WMO position. The use of this radio frequency band was not modified. POGO: featured in Science magazine�s article New sensors promise better picture of world ocean health. UNECE: GEO contributed to a Task Force on the Aarhus Convention on Access to Information, Public Participation in Decision-Making and Access to Justice in Environmental Matters in Geneva on December 10. UNGGIM: Greg Scott of UN-GGIM is awarded Geospatial Ambassador of the Year 2015. The Remote Sensing Handbook (CRC Press) is three volumes with contributions from 300 leading global experts. The handbook is a reference for remote sensing students, professors, scientists, professionals practitioners and experts. The technical handbook includes up-to-date examples of successful projects and case studies, and explains in detail, state-of-the-art space-borne, air-borne and ground-based remote-sensing systems. Spatial Data Infrastructures in Africa: A Gap Analysis, coauthored by UNEP, UNIGE, UNECE and GEO Secretariat (Journal of Environmental Informatics). Climate Change and Satellites, Knowledge for action, see article by Barbara Ryan and Andre Obregon, GEO Secretariat p.170 (Thales Alenia Space). GEO-XII Plenary and 2015 Ministerial Summit, IISD Reporting Services. WMO Meteoworld - The Power of Shared Earth Observations. South Africa: Minister Naledi Pandor � Group On Earth Observations Fourth Ministerial Summit. US, Mexico sign deal on sharing satellite data directly. Group Pushes for Using Earth observations in Decision Making, EOS magazine, 29 December Barbara Ryan interviewed by Randy Showstack, at the American Geophysical Union. The GEOSS Portal is featured in the Geneva Data Portal, a collection of information managed by the United Nations agencies, International Organizations and NGOs based in Geneva. NASA spinoffs: Bringing space tech to Earth, GCN magazine, 7 January, citing GEOGLAM and the Rice Decision Support System. UAE becomes Group on Earth Observations member, Trade Arabia, 17 January. European Association of Remote Sensing Companies (EARSC), Joint Board of Geospatial Information Societies (JBGIS), Mountain Research Initiative (MRI); as well as the Asia-Pacific Regional Space Agency Forum (APRSAF) as an Observer. See also EARSC is now a GEO Participating Organization! Arctic Observing Summit 2016 � What happens in the poles doesn�t stay in the poles. April 17 � 22, European Geosciences Union, General Assembly 2016, Vienna, Austria. April 20 � 22 Fourth High Level Forum on United Nations Global Geospatial Information, Addis Ababa, Ethiopia. April 26 � 27, 2nd International Conference on Geographical Information Systems Theory, Applications and Management (GISTAM), Rome, Italy. April 26 � 27, GeoBuiz Summit, Maryland, US. April 27 � 29 AfriGEOSS Symposium, Victoria Falls, Zimbabwe. May 2 � 4 GIS for users of EO for decision making, Geneva, Switzerland. May 2 - 4, GEO Work Programme Symposium, Geneva, Switzerland. May 4 Open Data driving Sustainable Development for business, government, civil society, Cape Town, South Africa. May 9 � 13 ESA Living Planet Symposium, Prague, Czech Republic. May 16 � 17 International Symposium on Earth Observation for one belt and one road, Beijing, China. May 23 � 26 Geospatial World Forum, Rotterdam, The Netherlands. May 23 � 27 Sustainable Innovation Expo at the United Nations Environment Assembly (UNEA), Nairobi, Kenya. May 25 � 26, International Symposium and Workshop on Impact of Geospatial Information on Society and Economy, Rotterdam, The Netherlands. May 26 � 27, 42nd G7 summit, GEO targeting Science Ministers and Heads of State communiqu�. May 30 � June 3, Fourth edition of European Space Solutions, The Hague, The Netherlands. May 31 � June 2nd 9th GEO European Projects Workshop (GEPW), Berlin, Germany. The AfriGEOSS symposium 27 � 29 April attracts participants from across the continent and beyond - African Heads of State adopted the Africa Space Policy and Strategy, at the 26th African Union (AU) Summit held in January, 2016. In the resolution of adoption, the Heads of State called on AfriGEOSS, GEO�s coordination programme for Africa, to work to mobilize the Earth observation community to contribute to the implementation of the Space Policy and Strategy. For more information and to register for the AfriGEOSS symposium click here. Statement: See the Statement on the GEO Cold Region Initiative (GEOCRI). White Paper: See the GEO-co-authored White Paper Advancing Arctic observing within the Global Earth Observation System of Systems (GEOSS) through a focus on Community-Based Monitoring. Earth Data Available At No Cost. Earth imagery from a Japanese remote sensing instrument operating aboard NASA�s Terra spacecraft since late 1999 is now available at no cost. Take part in the Data Revolution � endorse the report �Open Data in a Big Data World�, attend the Digital Earth Summit, international Data Week or the international Open Data Conference. USGS Partners with European Space Agency to deliver data. Landsat and Sentinel combine to deliver data in a practical way. New assets for GEOSS from China GEOSS and the Arctic Data Archive System bring the running total to around 200 million data sets. GEO Earth Observation Capacity Building resource facility Portal - organizations supporting GEOCAB Portal signed an MOU. Earth as Art: A Fusion of Science and Art from USGS. Supporting Implementation of the 2030 Agenda Through Knowledge, Data and Information. GEO UN and IO roundtable outcomes. 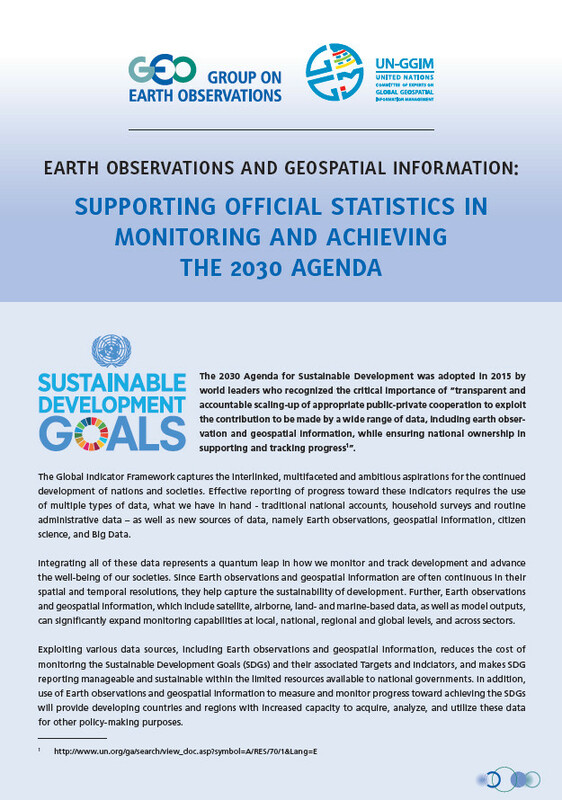 Geospatial Information and Earth Observations: supporting official statistics in Monitoring the SDGs side event at the 47th Session of the United Nations Statistical Commission 7 March in New York. IAEG forms geospatial information subgroup at the Inter-agency and Expert Group on Sustainable Development Goal Indicators meeting in Mexico City, 30 March � 1 April. The proposal was supported by GEO Members Mexico, Philippines, Senegal and Sweden. 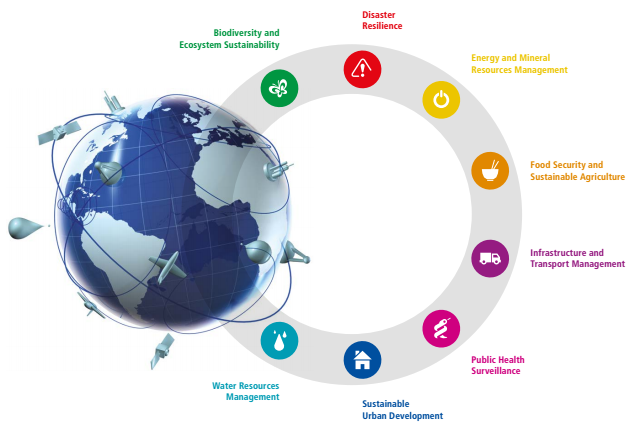 GIS for users of Earth observations for decision making on the Sustainable Development Goals - GEO, UNOSAT and Esri to host a 3 day conference on May 2 � 4 in Geneva, Switzerland. The latest Early Warning Crop Monitor and Monthly Crop Monitor (for March 2016). Mapping Mining to the Sustainable Development Goals - A Preliminary Atlas: The Columbia Center on Sustainable Investment (CCSI), UN Sustainable Development Solutions Network (SDSN), United Nations Development Programme (UNDP), and the World Economic Forum have released a new report. Global Forest Initiative operations highlighted on International Day of Forests. Measuring forests and carbon stocks using Earth observations. Mountain Forests and the Sustainable Development Goals: The Mountain Research and Development(MRD) is seeking papers that assess experiences of how to manage forests so that they can provide services that analyze the state of mountain forests as well as those that help identify future research or policy in support of sustainable mountain forestry. Geospatial Information and the Sustainable Development Goals, Deliver2030 website editorial Alvin K. Leong, Fellow, Pace Global Center for Environmental Legal Studies. A description of the kinds of contributions Earth observations can make to the SDGs. Marine Biological Diversity was debated at the 1st Session of the Preparatory Committee regarding the Law of the Sea Convention on the Conservation and Sustainable Use of Marine Biological Diversity of Areas Beyond National Jurisdiction. China: 35 global change/earth sciences Journals will share research. Journals have issued a common understanding to publish data openly. Israel: Free access to Israel Meteorological Service Data. From 2012, the Israel Meteorological Service started to provide free access to real-time data and historical observations. A recent article shows that new funding frameworks based on free and open access can provide a wide range of benefits to public and private sectors. US: Blue Economy Study demonstrates the value of Earth observations for Ocean Enterprise. The first study to look at business aspects of Earth observation measurements in oceans and water bodies. US: NASA Sea Level Change website keeps track of sea level change and its causes from space. Find out about how NASA satellite observations help our understanding of this complex topic. EARSC: European Earth Observation company of the year award, through ConnectinGEO, Entry deadline: 15 May 2016. EC: ERA-PLANET launched to promote use of Earth Observations in policy-making. Designed to strengthen EO in coherence with Copernicus and European contributions to GEOSS. IRENA Celebrates its 5th Anniversary. 4th April marked the 5th anniversary of IRENA�s formal creation as a fully-fledged intergovernmental organization. OECD: report on Water Governance in Cities was launched at the Cities and Water Conference, in the Netherlands in February. Read the report on line or Download it for free through the OECD I-Library (Username: gov-oecd2016 - Password: oecd2016-ilibrary). WMO: Hotter, Dryer, Wetter: WMO Statement on the status of the global climate in 2015. The year 2015 will stand out in the historical record of the global climate in many ways. Modern records for heat were broken: 2015 was a record warm year both globally and in many individual countries. The GEO Secretariat is calling for expressions of interest for a short-term Monitoring and Evaluation Specialist. GlaSS training material on the use of EO data for lake water quality allows students and professionals in fields as aquatic ecology, environmental technology, remote sensing and GIS to learn about the possibilities of optical remote sensing of water quality, by using the Sentinel-2 and Sentinel-3 satellites and Landsat 8. The material has been registered in the GEOCAB Portal. CODATA is holding an International Training Workshop in Big Data for Science in Beijing 4 � 17 July. Applications should be submitted by 18 April. The CODATA-RDA Research Data Science Summer School Trieste, Italy, 1-12 August. The first full introductory course is supported by ICTP and from The World Academy of Science, as well as CODATA and RDA. South African corn withers amid worst drought on record, Reuters/Financial Times, 10 February (requires you to be signed into the FT website). Synopsis: South Africa�s farmers are battling the worst drought on record, as crops fail and livestock perish. And it is not just South Africa. The whole southern African region has been hit by an intense drought since early 2015 that was brought on by the El Ni�o weather phenomenon. Countries such as Zimbabwe, Malawi, Mozambique and Madagascar will also be in need of food aid, says GEOGLAM, a group that works with international organisations to monitor crop conditions in countries at risk of food insecurity. Combining citizen and satellite biodiversity data, EC Research and Innovation website, 11 March, mentions EU BON. Free Data Proves Its Worth for Observing Earth, A comprehensive articulation of the worth of free EO data, USGS blog, updated March 2016: Free data for earth observation) is a public good - along with public education, public roads, and public parks. Conmemoran mañana el centenario del Observatorio de Izaña (Tenerife). La Agencia Estatal de Meteorología (Aemet) conmemora este año el centenario del Observatorio Meteorológico de Izaña, ubicado en la isla de Tenerife a 2.373 metros de altitud, en un acto que se celebrará mañana en el propio Observatorio de Izaña. Congratulations and welcome to Mongolia. 30 July - 7 August 2016, The 41st Scientific Assembly of the Committee on Space Research (COSPAR) will be held in Istanbul (Istanbul Congress Center). 11 - 13 September 2016, �SciDataCon 2016: Advancing the Frontiers of Data in Research� conference will take place at the Sheraton Denver Downtown Hotel, Denver, Colorado, USA, as part of International Data Week (11-16 September 2016), convened by CODATA, the ICSU World Data System and the Research Data Alliance. 12 - 14 September 2016, United Nations / Austria Symposium on Integrated Space Technology Applications for Climate Change.Organized jointly by the United Nations Office for Outer Space Affairs and the Government of Austria -with the support of the European Space Agency (including Keynotes on their Climate Change Initiative and Copernicus programme by Mr. Aschbacher) - the Symposium will be held at the Space Research Institute of the Austrian Academy of Sciences. 14 - 16 September 2016, �GEOBIA 2016: Solutions & Synergies� will take place at the Faculty of Geo-Information Science and Earth Observation (ITC) of the University of Twente, in Enschede, The Netherlands. 26 - 30 September 2016, �The 66th International Astronautical Congress: Making Space Accessible and Affordable to all Countries� will be held at the Expo Guadalajara in Guadalajara, Mexico. 3 - 6 October 2016, iPRES 2016,13th International Conference on Digital Preservation, Bern - Switzerland. 10 - 11 October 2016, ConnectinGEO Workshop on Gap Analysis and Prioritization will be held in IIASA Laxenburg, Austria. 12 - 13 October 2016, ENEON Plenary Workshop will be held in IIASA Laxenburg, Austria. 18 - 20 October 2016, The International Conference & Exhibition on Advanced Geospatial Science & Technology (TeanGeo 2016) is scheduled to take place in Tunis, Tunisia. 24 - 28 October 2016, The 11th International Conference of the African Association of Remote Sensing of the Environment (AARSE 2016) will be held in Kampala, Uganda. 28 November - 1 December 2016, Pacific Islands GIS & RS User Conference 2016 theme for this year is "Improved Data, Improved Maps". It will be held in Suva, Fiji. The GEO-XIII Plenary and related events will take place at the Park Inn in St Petersburg, Russian Federation, 7-10 November, 2016. GPSDD: Call for Proposals on Collaborative Data Innovations for data production, dissemination and use, primarily in low-income countries and lower-middle-income countries , for sustainable development generally and linked to the Sustainable Development Goals (SDGs) in particular. UNGGIM: The Addis Ababa Declaration on Geospatial Information Management Towards Good Land Governance for the 2030 Agenda was issued at the High level forum held 20 � 22 April 2016, Ethiopia. WCRP and GCOS:Established an International Data Prize, awarded annually to honour achievements in (climate) data product generation, data management, data preservation, data monitoring, and other data relevant activities by an early- to mid-career researcher. Nominations of suitable candidates should be forwarded to WCRP and GCOS), and must be received by 1 October 2016. 2017-2019 GEO Work Programme approved. Programme Board - Recommendations for the functions, duties, members and observers to the Programme Board were approved. Commercial Sector - Sub group reinforces further engagement. Statements - read Member and Participating Organization Statements to GEO-XIII Plenary. ISS sends message to GEO during GEO-XIII Plenary. Investments in open Earth observation data set to grow - Government investments in satellite and in situ Earth observations make up around 65 percent. Companies not only contribute in terms of hardware; they also stimulate provision of services. Welcome to the Thirteenth GEO Plenary, by Barbara Ryan, Secretariat Director, GEO. All photos are available here. UNFCCC Earth Info Day and open Earth observation data - ICOS represents GEO at the UNFCCC COP 22 in Marrakech. New look GEOSS Portal for better access to Earth observation data � a complete transformation unveiled. First GEO DAB API virtual workshop � protocols to build GEO DAB software applications shared with participants from across the world. GEO supports the Partnership for Resilience and Preparedness (PREP) to enhance access and use of data and information to help communities build climate resilience. Partnership for Resilience and Preparedness fact sheet: Launching New Public-Private Partnership and Announcing Joint Declaration on Leveraging Open Data for Climate Resilience. Geospatial Information, Key to Achieving the 2030 Agenda for Sustainable Development, commissioned by DigitalGlobe and produced by Geospatial Media & Communications, supported by knowledge partners GEO and UN-GGIM. Global Partnership for Sustainable Development Data. Earth observation for SDGs toolbox. Draft paper framework for understanding SDG interactions, ICSU, 2016. Earth observation and geospatial information are enablers for the SDGs � video interview with GEO Secretariat Director, Barbara Ryan. New tool to visualize marine life unveiled by NOAA Administrator: Ecological Marine Units developed through GEO BON presented at the IUCN World Conservation Congress. New paper published on the policy forum of the Remote Sensing in Ecology and Conservation summarises conditions for a collective engagement of space agencies. Remote sensing of species dominance and the value for quantifying ecosystem services by Stephanie Pau and Laura Dee. Atlas of the Human Planet 2016, published to coincide with Habitat III, based on GEO�s Global Human Settlement Layer. GEONETCast-Americas 50 stations across 12 countries in the Americas and still expanding. Survey on Earth Observation Capability for the African Union � contribute to the AU Space Programme Earth Observation Capability Audit. An inventory of the African private EO and Geospatial industry, published by AARSE, the African Association of Remote Sensing of the Environment in cooperation with EARSC supported by the European Commission and Spacetec Partners. Video demonstration of some of the capabilities of the Marine Biodiversity Observation Network (MBON) portal. Partnering for a more accessible future: Belmont Forum and the Group on Earth Observations, Erica Key, Executive Director, Belmont Forum Secretariat. Leveraging Earth Observations for a food secure world from Satellite to soil. Barbara Ryan�s talk at the Royal Society in June. ASREN Accredited as a Partner Organization for the Group on Earth Observations, Abu-Ghazaleh. International Journal of Digital Earth Special Issue, Arctic and High Altitude Mountain Cold Regions: Sustainable Earth Observations and Climate Change. H2020 EO Big Data Shift, call for proposals exploiting Big Data to a downstream service industry. H2020 Africa Remote Sensing, call for proposals for Earth observation services for the monitoring of agricultural production in Africa. H2020 Climate Services, call for proposals exploiting the added value of climate services. US call for proposals for the GEO Work Programme 2017-19. Call for nominations for the Ocean Observations Panel for Climate (OOPC), a scientific expert advisory group to the Global Ocean (GOOS) and Global Climate (GCOS) Observing Systems and the World Climate Research Program (WCRP). See GEO's website for upcoming events. Read the Press Release on how these organizations plan to work with GEO. GEO Plenary-XIV: save the date, 25-26 October, 2017 in Washington DC. The GEO Work Programme Symposium will be held in Tshwane, South Africa on 12 and 13 May 2017. See the meetings page for more information. More than 95 organizations engaged in discussions on provision of open EO data. New datasets in the GCI include ICIMOD and ESA Climate Change Initiative. GEOSS users and Data Provider Workshops to benefit from GEOSS enhancements. 6th Programme Board, May 23-24, Athens. Members' views on the first GEO Programme Board of 2017 from Japan, Ghana and Canada. New report illustrates how EO supports Sustainable Development through Case Studies. UNFCCC SBSTA Information Note references GEO, paragraphs 32-34 within the section on key partners alongside GCOS, IPCC, WCRP, and WMO. New Zealand Government thanks ChinaGEOSS, CODATA and IRDR for their help following the Kaikoura Earthquake. GEO is part of the Marketplace at the Global Platform for Disaster Risk Reduction (GPDRR) Cancun, Mexico May 22-26, come and talk to us. Opportunities for lightning talks are available. GEO handbook on Biodiversity Observation Networks downloaded more than 74,000 times. A new map of global ecological marine units, an environmental stratification approach, booklet launched at the American Association of Geographers annual meeting in Boston, by USGS and Esri. The 9th GEOSS Asia Pacific Symposium. AfriGEOSS Symposium, 13-15 June, Sunyani, Ghana, register now. China ready to release massive amount of geographic data to the public. Global Geospatial Industry Outlook Report launched at the Geospatial World Forum, 2017, which had almost 3,000 participants . Vacancy notice: GEO Secretariat Director (2018-2020). Vacancy notice: Strategic Communications and Social Media Specialist. Copernicus Masters, 2017: applications are open, apply by 30th June. 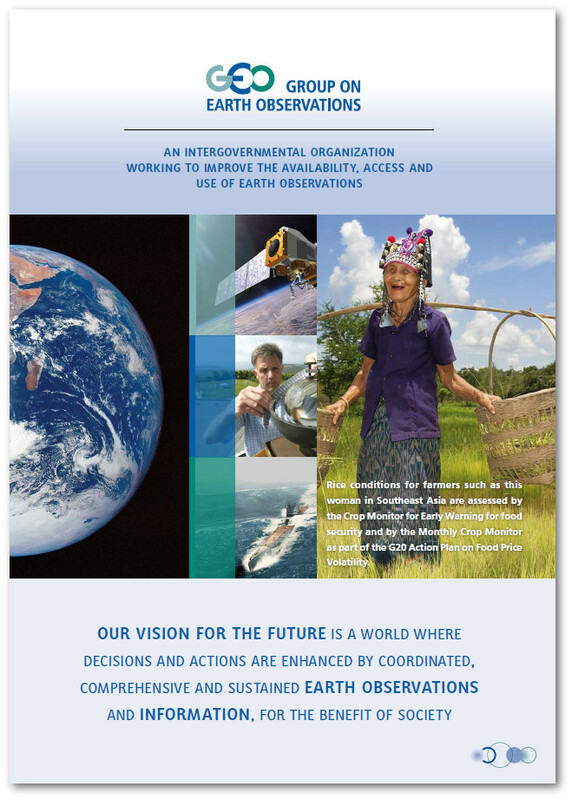 OECD brochure on Earth observation for decision making. CODATA is accepting submissions for sessions and papers (by 30 June) for the CODATA 2017 Conference, 'Global Challenges and Data-Driven Science', 8-13 October, 2017. 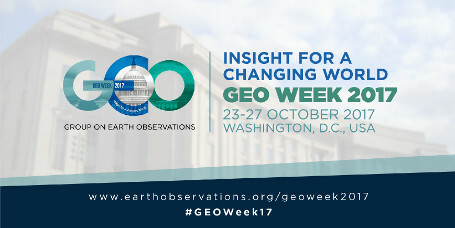 On 23-27 October 2017, GEO will convene the Earth observations community in Washington, D.C. for GEO Week 2017. GEO Week, consisting of the GEO-XIV Plenary, Side Events and Exhibition, will highlight and promote the role, applications and opportunities to use Earth observations in delivering "Insight for a changing world". With a focus of delivery and impact, GEO Week will explore the use and applications of Earth observations in both the public and private sectors for the benefit of humankind. Registration for GEO Week Side events is now open. Space is filling up fast, so be sure to register soon! GEO Week offers Sponsors the opportunity to showcase their work to the global Earth observation community, engage with potential customers and partners, and identify innovative business development opportunities. Calling all EO communications professionals! GEO invites communictors from the EO community to join us during GEO Week for a Communicators Roundtable on Monday, 23 October, to share experiences, ideas, and to form a network in support of our shared communications objectives. Save the date on Sunday, October 22, and join the Open Data and Earth Observations communities for a GEO Week 2017 icebreaker & networking evening that will explore the impact of Open EO Data on global development challenges. Use this GEO Week 2017 mobile app to navigate the GEO Week schedule and venue, connect with other attendees, share your thoughts and much more! Get it for Android devices here and for iOS devices here. Over 700 people from diverse geographies, sectors and technical areas came together from 23-27 October 2017 in Washington, DC, to explore the use and applications of Earth observations for the benefit of humankind. Thank you to all the participants, speakers, exhibitors, sponsors and organizers who made GEO Week 2017 a success! Find presentations, documents, videos and photos from GEO Week 2017 online here. The Group on Earth Observations is pleased to announce the appointment of Gilberto Câmara as the next GEO Secretariat Director, effective 1 July 2018. As an outcome of the GEO Communicators Roundtable at GEO Week 2017, a GEO Communicators Network has been established on Slack. The objective of this network is to bring together communications practitioners from GEO member agencies, participating organizations, partners, flagships, initiatives and community activities, in order to share experiences, knowledge, and coordinate and support communications efforts in support of our shared objectives. For an invitation to join this group, please email mwest@geosec.org. Watch GEO Week Side Events and Plenary Sessions online here. Access GEO Week 2017 Photo Albums here. Japan looks forward to welcoming the GEO community to Kyoto for GEO Week 2018. Watch the official announcement video here. GEO at COP23: GEO is at COP23 to highlight the crucial role of Earth observations in the fight against climate change. Vist the GEO at COP23 hub for information on our exhibit, side events and more. 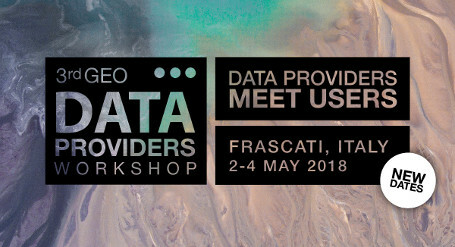 Join us from 2-4 May 2018 at the European Space Agency in Frascati, Italy, as we bring together Earth observation data providers and users from around the world to share knowledge and best practice in the management and use of Earth observation data and information, while working together to enhance together the Global Earth Observation System of Systems (GEOSS). Register today! As a sponsor of the 3rd GEO Data Providers Workshop, sponsors can reach a highly diverse and engaged community of Earth observation data users and providers from both the private and public sectors. Join us online or in person at the European Space Agency for GEOSS/HACK 2018, where developers will compete to create data discovery and access tools that solve global challenges. From GCI to GEOSS Platform: a comprehensive response to user needs. Summer School "Sentinel for Applications in Agriculture"
Join us from 11-12 June in Geneva, Switzerland for the 2018 GEO Symposium. Participants will contribute to the future of the GEO Work Programme, share knowledge and connect with the global Earth Observation community. Learn more and register. The 2018 GEO Climate Workshop will take place on 13 June in Geneva, following the GEO Symposium. Learn more and register. 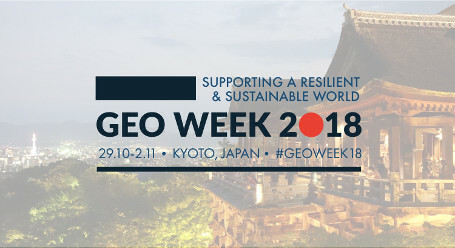 GEO Week 2018 and the GEO-XV Plenary will be held in Kyoto, Japan from 29 October to 2 November 2018. Learn more. Eight new Participating Organizations have recently joined GEO, bringing the total to 126. Learn how these organizations contribute to improving the availability, access and use of Earth observations for the benefit of society. Read more. The 3rd AfriGEOSS Week and Symposium will take place from 22-29 June in Libreville, Ghana. Learn more and register. Europe-based organizations involved in developing, promoting or deploying Earth Observations derived solutions are invited to submit their Expressions of Intent to the EuroGEOSS Initiative by 30 June. Read more. G20 Agriculture Deputies applaud achievements made since the initiative's 2011 launch. Read more. Speakers at GPSDD's inaugural Data for Development Festival demonstrated the value of analysis-ready data systems for achieving the SDGs. Read more. Argie Kavvada of NASA and EO4SDG recaps examples from national governments using Earth Observations to monitor and implement the SDGs. Read more. Data Cubes are transforming the way we use satellite data. Learn more about Data Cube technology and how it contributes to better water management. Read more. With 6,000 users in 169 countries, GEONETCast provides Earth observation data, products and services to people in disaster zones and areas without internet access. Read more. From H2020 GEOEssential to the Swiss Data Cube, the University of Geneva is contributing to the GEO Work Programme and mission in a variety of areas. Read more. Why do some nations choose to restrict satellite data, while others make it openly available? Mariel Borowitz answers this question and more, with highlights from her book 'Open Space'. Read more. Register now for Microsoft Research's webinar on the AI for Earth Program. Read more. GEO demonstrates the value of Earth Observations for climate change at Geneva's first International Climate Show. Read more. A secondee from Great Britain’s National Mapping Agency has joined the Group on Earth Observations (GEO) Secretariat to coordinate disaster work across the GEO community. Read more. Maddie West speaks with Shushanik Asmaryan to learn how Armenia is benefiting from their contributions to the GEO Trust Fund and Work Programme. Read more. Dina Eparkhina looks back at the 2018 EOOS forum, where 80 ocean science managers, researchers, policymakers and private companies dicussed the value and need for integrated and sustained ocean observations. Read more. Natacha Klein outlines recent upgrades to the GEOSS Platform, designed to provide users with more ways to access data. Read more. Join the GEO community between 29 October - 2 November 2018 in Kyoto, Japan, for GEO Week 2018 and the GEO-XV Plenary. Registration will open in mid September. Learn more. The ERATOSTHENES Centre of Excellence plans to create opportunities for ground-breaking research on the systematic monitoring of the environment using Earth observations. The government of Cyprus views the project as a unique opportunity to develop a presence in the space sector and boost the local, regional and European economies. Read more. The Group on Earth Observations (GEO) and Resilience Brokers convened a special session on Earth observations for climate-resilient cities at ICLEI’s Resilient Cities 2018 congress in Bonn, Germany. Read more. GEO takes up the global challenge of land degradation with the new GEO Land Degradation Neutrality (LDN) Community Activity. Read more. GEO Blue Planet’s Emily Smail reflects on the value of Earth observations for the health and proper management of marine and coastal waters, against unprecedented challenges from pollution, resource exploitation, ocean acidification and climate change. Read more. World Environment Day - several GEO activities for the environment! Douglas Cripe looks at how various GEO initiatives and activities assist local, regional and global efforts to manage and respond to environmental challenges including food, water and energy security, resilience to natural hazards and climate change. Read more. At GEOSS/HACK 2018, teams competed to develop data access and discovery tools that contributed to solving one of six real global challenges. The winning entry, submitted by Joakim Adrup (ESA) and Christian Langer (GEO BON / iDiv), addressed the ‘Protecting our Forests’ challenge: to develop a biodiversity monitoring tool to motivate local patrols in Madagascar to engage with satellite images and contribute in-situ observations from the ground. Read more. Forty experts from various United Nations entities, academia, governments, private companies and international initiatives met at the Ministry of Education in Mexico City from May 2 - 4 to discuss the development of a region-wide system for monitoring and forecasting oil spills and sargassum. Read more. 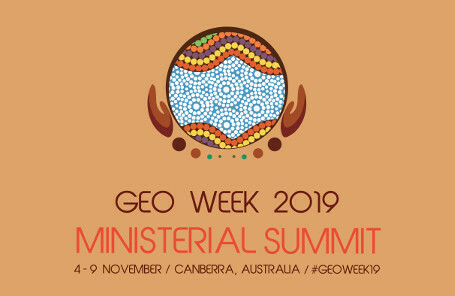 In November 2019, Ministers from GEO’s 105 Member governments, business leaders, heads of international non-profits and passionate experts will meet in Canberra, Australia for GEO Week 2019 and the GEO Ministerial Summit. The week’s events will focus on ensuring data about our planet becomes a core input to our strategic economic decision making and our day-to-day business, environmental and development decisions. Learn more. Join us at the GEO Data Technology Workshop (Vienna, Austria / 23-25 April) to connect with international experts on data management, sharing and governance, and have your voice heard on a range of internationally-relevant issues, including data governance and policy challenges, remote and in situ Earth observation coordination, knowledge sharing, platforms, analytics and more. Registration required by 1 April. Learn more. 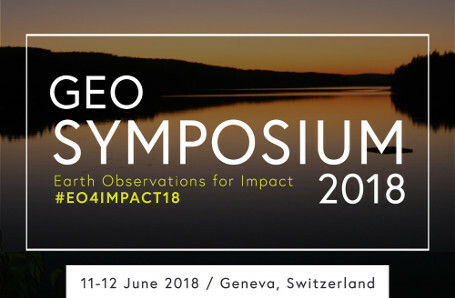 Join the global Earth observation community in Geneva this May for the 2019 GEO Symposium, as representatives from GEO’s 70+ Work Programme activities and initiatives share their progress, knowledge and make plans to maximise the impact of Earth observations for sustainable development. The 2019 Symposium takes place at a critical moment in the development of the 2020-2022 GEO Work Programme. Participants will have the opportunity to take part in discussions that will shape GEO’s direction over the next three years. Learn more. This new collaboration between GEO and Amazon Web Services (AWS) offers GEO Member agencies and research organizations from developing countries access to cloud services to help with the hosting, processing and analysis of big data about the Earth to inform decisions for sustainable development. Deadline for applications: 31 March. Learn more. In the second edition of the GEO - AWS Earth Observations Cloud Credits Programme Webinar series, hosts from NASA / CEOS, Sinergise, Radiant Earth Foundation and Development Seed will explore tools, software and services that help users leverage big Earth observation data and the AWS cloud computing environment. Read more. Do you have an impact story that highlights the role that GEO or one of its initiatives or activities played improving the availability, access or use of Earth observations for a sustainable planet? We are looking for case studies where GEO activities led to measurable and verifiable impact, especially those related to the United Nations 2030 Agenda for Sustainable Development, the Paris Agreement, or the Sendai Framework for Disaster Risk Reduction. 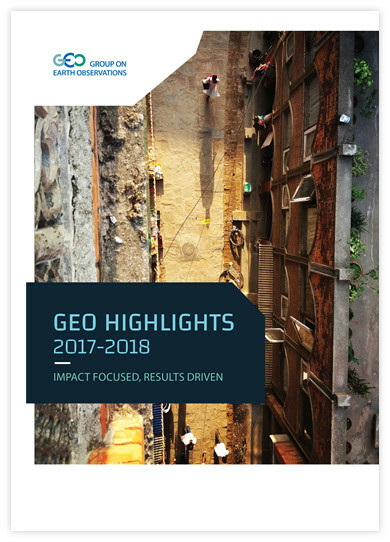 A compilation of the best impact stories will be published in the GEO Impact Report 2016-2019 and featured at the 2019 GEO Ministerial Summit in Canberra. Please contact mwest@geosec.org for more information. Following the devastating January 2019 Brazilian dam collapse, Chinese satellite data products were provided to support Brazilian disaster response as part of the ChinaGEOSS Disaster Data Response Mechanism. Read more. In this blog post, we outline some of the ways countries will benefit from participation in GEO Week 2019 and the Ministerial Summit, and call on governments to step up their investments in Earth observations to support decisions that lead to returns across their economies and advance sustainable development. Read more. Now open for public use, the NextGEOSS data hub enables users to easily explore European Earth observation data and services, and the platform services empower developers to build their own R&D or commercial applications with dedicated tools and support. Read more. In the first of the GEO Member Spotlight series, we look at some of the ways China is leveraging GEO to strengthen regional and global development cooperation. Read more.